Problem now solved! And it proved not to have been VMWare's fault. I don't know about Parallels -- even though I bought that program for full $80 retail at the Apple store in New York last month (it being the only one available), I never heard back on my requests to its tech support line. But VMWare, which I downloaded as a free 30-day trial product, did reply and gave me the right answer. (Details below. *) I will with relatively good cheer pony up my $80 to register the product -- or $50, after a $30 rebate for previous purchasers of the rival Parallels. So as of this moment, I have, in the Air: a physically lovely machine; which has certain limits (no built in CD/DVD, not many ports, no swappable battery) but that starts and responds more quickly than my other laptops do; that runs its normal suite of Mac programs; that boots up as a Windows computer much faster than my Windows machine does; and that at this very moment is running three or four of the Windows programs I truly rely upon. (The idiosyncratic Zoot most of all, plus others for a later time.) I can cut and paste material from Mac programs to Windows ones, and back the other way. Another shot of Zoot running on the Mac Mini, showing how Fusion's "unity" mode presents a full Windows screen but with clickable Mac icons on the bottom. I am unemotional about my computer choices. Rather, I'm emotional in the sense that I like 'em all. 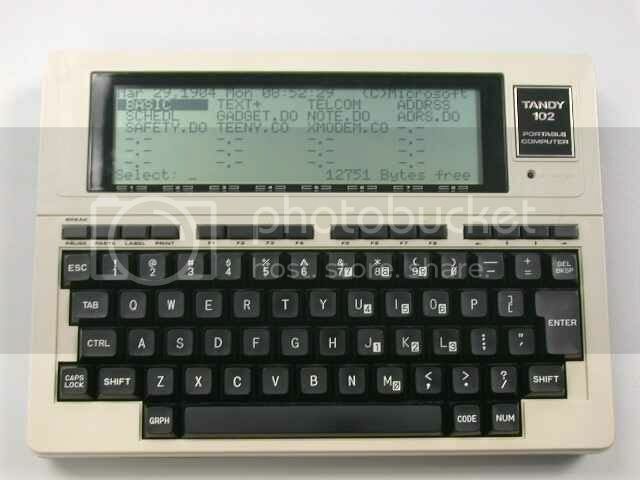 (Below, an old flame I still think fondly of: the Tandy 100, from back at the dawn of time, which was the MacBook Air of its moment and was marvelously efficient as a note-taking and writing machine.) The MacBook Air is strikingly attractive, but there is also a dark, suave, utilitarian elegance to the entire ThinkPad line, which I've long been loyal to. From relying on PCs but keeping up with Macs over the years, I know that both have shortcomings and that either can get the job done. But, now that I have VMWare going, I am more impressed than I expected with the ease of running any kind of program I want on this one machine. Next stages in the inquiry: what to do about the zillions of emails from the last decade-plus that I now have stored in (Windows-only) Outlook .PST files. I think the answer is -- install Outlook under VMWare too, but we'll see how that goes. And, watching to see which aspects of this machine -- or of the MacMini I've also equipped with VMWare -- could become as annoying as the slowness and unreliability of Vista now are. Which leads to one other line of inquiry: whether the official Service Pack 1 for Vista, scheduled for release Real Soon Now, speeds up the system as much as I've heard. (I have applied some interim patches that have made a noticeable difference.) Someday a business historian will figure out whether Microsoft's decision to release the obviously-unready version of Vista one year ago was a minor bump that will soon be forgotten, or instead a real strategic error, because of the customers it has alienated and spurred to look for alternatives. For now, happy to have figured out the VMWare step. *Details: to set up either VMWare Fusion or Parallels so that it can run Windows, you need an original installation disk plus product-activation code numbers for Windows XP, Vista, or whatever other operating system you want to use. I had such a disk plus the numbers, and I was first using for an installation on a MacMini, which has its own built-in CD/DVD slot. For whatever reason, neither Fusion nor Parallels would recognize the disk and proceed with the full Windows installation. But when -- at VMware's suggestion -- I downloaded an electronic version, or "disk image," of that same Windows installation CD, the rest of the process worked easily and fine. (In general you get the disk image from wherever you originally got your legit copy of Windows -- more info on the VMWare and Microsoft sites.) 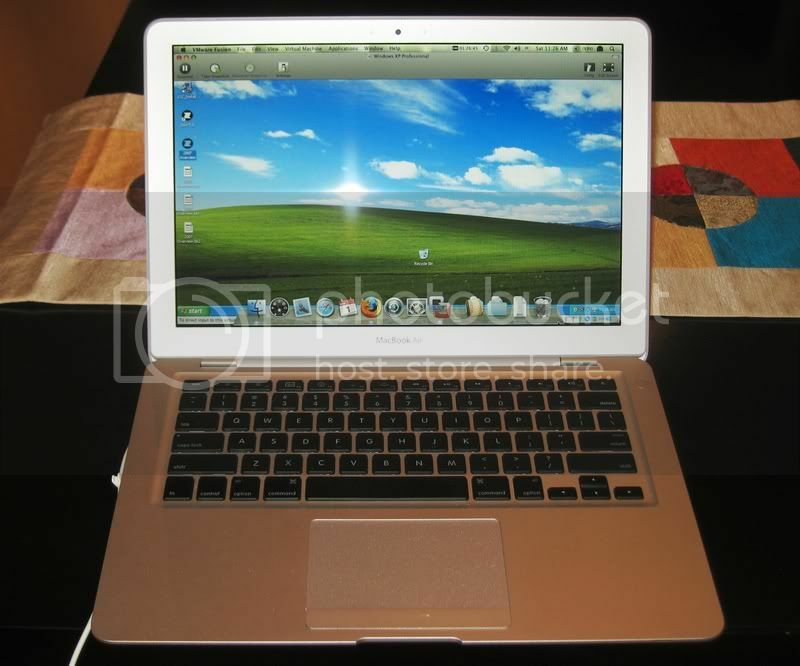 Once that had worked on the MacMini, I followed the same steps with the MacBook Air.